I promised Jen would be back with another wonderful tutorial for all of us and this time she's teaching us a wonderful way to add a gorgeous binding to the Ofelia. Pair this with her adorable tie and you have the perfect brother sister set! The Ofelia pattern is my all time favorite little girl dress pattern. Its FOUR pieces, easy to sew, only takes a yard of fabric, is stylish and well, Amelia my daughter loves it. Which means she already has four hanging in her closest. But they are getting small and are ready to pass down. Since I've already made them with the cute ribbon down the front, I thought I’d try something new! Digging into my scrap bins, I found the answer. Below I’ll show you how to create this super cute patchwork binding as well as how to attach it three different ways. This is also a great way to add length to a dress if you have a tall lanky girl like I do. By no means am I the expert in binding the hem of a dress. I've learned by trial and error. The point of this tutorial and showing you three different ways is to get you motivated! To get you to sew! To look at these, and think “Hey that’s not so hard-I can do that!” Because really, that’s what it takes, a little motivation, a little confidence and a desire to try. Make a cute dress for your little one and then make it your own with special little touches! The first method is what I most commonly see in today’s patterns. It’s great to use if you want the inside seam to be completely hidden and if you don’t have a serger. Measure the bottom of your dress to determine how long your binding should be and add ½ inch. Square up the binding using a ruler and a rotary cutter. I found that five inches wide on all of these worked best. I made the 6/7 size dress-adjust the binding according to the dress size and preference. Pin the binding to the bottom of the dress raw edges together and right sides to right sides. Join the ends of the binding by sewing a ¼ inch seam and creating a circle. Press. Follow steps 1 and 2 above to make your binding. Fold the binding in half with wrong sides together. Press. The last method is probably the most traditional. It’s a double fold and adds weight and some thickness to the hem. It would be good on a heavy weight fabric such as wool. It also creates a narrower hem. Follow steps 1 and 2 in the first set of directions to create your binding. Open the binding and fold one side all of the way to the center line. Press. Fold the other side towards the center but leave a ¼ inch gap. Remember the tie tutorial from the other day? Well, all you have to do is slip it on a headband and your little girl has a super cute bow headband. Depending on how thick the headband is, you might need to make the center tighter by sewing a ½ inch seam allowance instead of a ¼ inch. You could also attach it to various clips! I would add a touch of hot glue to the top of the clip to secure it. Amelia only wanted them on the headband, so I just fed the clip through to demonstrate; which actually worked just fine in my hair! Hopefully this tutorial has inspired you to sew something pretty for your little one! To get you started, Shelly & Daniela will be giving away a free PDF pattern of the Ofelia dress to one lucky winner!!! Perfect timing for this Holiday season. Just leave a comment on this post to enter. It would be great to hear what you are working on now or what you’d like to work on soon! For an extra entry follow us on Facebook or Pintrest! Please also make sure your email is in the comment or is linked to your comment! A winner will be chosen by random on Monday! If you are like me, there are 6 seasons in a year. And right now, it's fashion week season! I have been following along and even though NY Fashion week hasn't even wrapped up, it's pretty obvious that fur will carry through to next season! Faux fur - pretty please! It feels so validating as we launched our Lux Vest pattern in late December. We truly think every little girl should have one! One yard of the fuzzy goodness will yield two of those adorable vests. For our photoshoot I made two identical vests for our two models. They are really good friends (so are their moms) and whenever they show up in their partner gear, people literally stop us to ask where they got the vests! It's a super quick sew and the best part is to see people's jaws drop when you tell them that it's handmade! Yay! 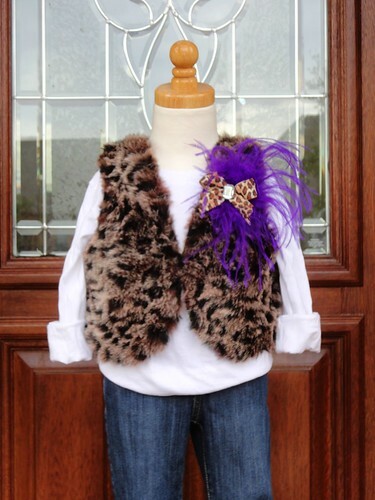 Babycenter put this trend alert-fur-vests on their blog. ...which reminds me so of this funky vest Regina made from our pattern! How adorable is the crew cuts vest with a satin ribbon around the waist? Threads Magazine has a sewing school article about how to put together the fantasy fur jacket. - Fabric Depot stocks the fur I used. - Fabric.com has some great long pile as well as short hair fur. - Fabric Empire is running a sale on furs right now. - I'm stuffed fur has some really great ones too! Now, get your vacuum out (trust us, you'll need it! ), get ahead of the curve and sew one (or make that two!). We'd love to see the results on our flickr group! We can't believe 2011 is almost over and what a year! Will you be hosting a big party to celebrate the coming year or staying in to watch the ball drop? Do you need the perfect addition for your little ones outfit to celebrate? Well, we have something special for you! As we quickly approach this new year we are very excited to introduce our first Figgy's e-pattern: The "Lux Vest"- priced at $8, available exclusively through our website! But because giving is better then receiving - especially for all our Figgy's friends - we'll include the e-pattern FREE of charge with the purchase of any pattern placed on the site now through January 1, 2012! Simply use the coupon code LUX2011 at checkout for sewing fabulousness. We hope you have a fun & safe night out on New Years Eve, or if you're like me, a cozy and quiet time with my boys (what could be better? ).